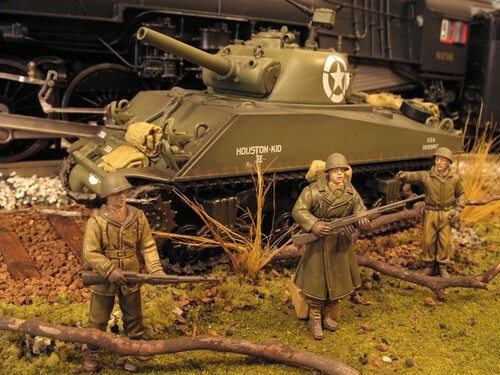 A realistic World War II-era model train setting by Staff Sgt. A. Jonathan Born, Mississippi Army National Guard. Part two of Military Theme Night. The two sets you will see are by TTHH, Toy Train Historical Foundation. The Army set was probably their largest seller, but even then not many were made. It is a reproduction of a Lionel set made about 1917. The General’s Salute set has cars named after famous generals. Only about 25 of these were ever made and the one seen has the only blue body, tan roof cars made. I acquired this set from the family of one of the TTHF founders when they were selling of his estate.